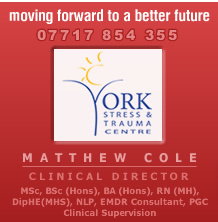 Home York CBT services, counselling and therapy from York Stress and Trauma Centre. Home page: introducing YSTC. Hypnosis Hypnosis is an altered state of consciousness - see if it can help you! Employee Assistance Programme A dedicated evidenced based psychological intervention programme for employers based in Yorkshire. Articles Learn more from our articles! OCD Two percent of the population suffer from OCD at some point in their lives. Eating Disorders What are eating disorders? Social Phobia What is Social Phobia? Chronic Pain Chronic pain is long-lasting pain - learn more! How useful is Psychotherapy? View the results to establish how useful Psychotherapy is. Find Us We have two offices in York. Click here to find directions.